A new exhibition at University of Lynchburg is giving new attention to artwork by students and alumni — and some cash to the artists. “First Impressions” contains prints made in printmaking classes in recent years. Art professor Beverly Rhoads curated the exhibition in the lower Daura Gallery lobby to show off her students’ work but also teach them about making a living as an artist. Beginning at 4 p.m. Thursday, September 21, during the artist reception for Rhoads’ exhibition in the main gallery, she will launch a silent auction to sell some of the students’ works. The exhibition will also feature flash sales, where prints can be purchased on a first-come, first-serve basis after being announced on social media. “I’m trying to teach them that there are a lot of different ways to present your art, sell it, and get people interested,” Rhoads said. Most of the works came from recent alumni who took Rhoads’ upper-division printmaking class, including Amber Ingram ’15. “I feel very humbled that one of my prints created during that class is getting exposure,” Ingram said. 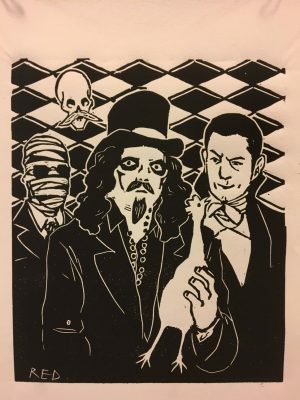 The class helped Ingram fall in love with the art of printmaking, which involves creating an image on one surface, applying ink, and applying the surface to another medium, such as paper, to transfer the image. The tactile process engages all the senses, something that Ingram enjoyed as a break from her specialty of computer-based graphic design. “My favorite part about taking the printmaking course while at Lynchburg was learning how to listen for the ‘tacky’ sound that the ink makes in order to determine if your ink was at the right consistency to be used,” Ingram said. “This may sound crazy, but if you experience it for yourself, I think you will find that this is a different experience where you need to use all senses in order to create a well crafted print. 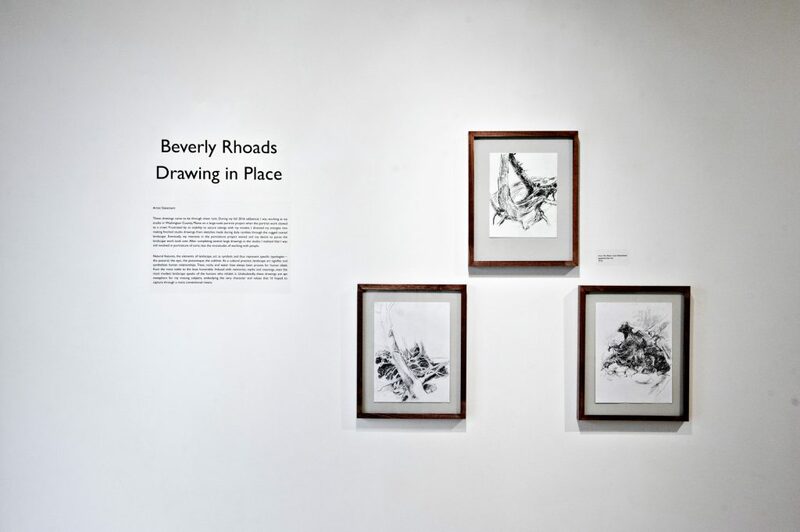 The exhibition of student work is displayed at the same time as Drawings in Place, an exhibition of recent drawings by Rhoads, in the Daura Gallery. The exhibition features charcoal-on-paper drawings of trees near the coast of Maine. She completed the drawings in 2012 when another project — portraits of women in coastal communities — fell through. Rhoads opted to draw trees instead, and she realized that each drawing was, in turn, a portrait of of a specific tree. She sketched hundreds of studies of trees, and then spread them out in her cabin to decide which trees to feature in final drawings. The result is more than a dozen large drawings that invite viewers to imagine coming up on the scene in a forest and finding away around thickets and fallen trees.